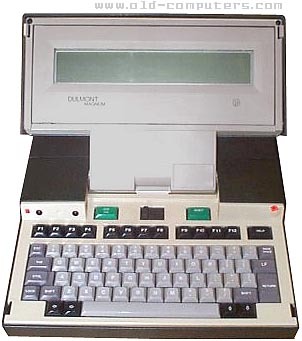 Like the HP-110 or the Sharp PC-5000, the Dulmont Magnum belongs to the first family of notebook computers with LCD screen (not yet back-lighted). Moreover, it was the first computer conceived and manufactured in Australia. It was also called Kookaburra (an Australian bird) for some export markets. The Magnum was a PC-compatible system featuring an Intel 80186 processor, 96 KB of RAM, an 8 line LCD screen and several management software in ROM: word processor, spreadsheet, telecommunication, file manager, and appointment. Additional ROM software could be added thanks to two 128 KB cartridge slots. A rechargeable Ni-Cad battery pack allowed ten to twelve hours of continuous use, and a lithium battery kept the content of the RAM memory when the system was turned off. Due to various RAM/ROM configurations in the system, the drive letters assignation was specific to the Dulmont: drive A corresponded to the software in ROM, drives B and C, to each optional ROM expansion, D to the internal C-MOS RAM, E and F to the external floppy disc drives. I was the engineering manager for this project. Most of the information is accurate, although it actually came out about 2 years earlier, and definitely pre-dated the Sharp 5000, and the HP-110. The speed got up to 8MHz, and the display was up to 40 lines by the time the company folded. It also contained patented power saving features whereby it would put the processor to sleep between keystrokes. see more Dulmont Magnum Ebay auctions !